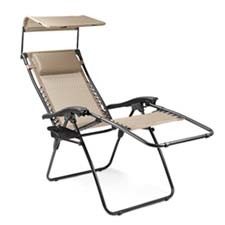 With the Serenity Reclining Lounge Chair with Sunshade, you are sure to experience the finest comfort and quality in outdoor lounging furniture. Designed with leisure in mind, this chair can be enjoyed on your porch, deck, pool, patio, or alongside your RV. The sunshade can be folded behind the chair when not in use. Sit back and recline in this chair comfortably!